This is my second time working with Jolina. The first time I was here, I often wondered “how does she do it?”. Jolina has a real knack for assessing a situation, quickly determining a solution and providing actionable next steps. When I heard that Jolina was being promoted to Vice President of TopRank Marketing, I jumped at the chance to interview her about her new role. In her years at TopRank Marketing, Jolina has exemplified many of the core values that our company stands for. She is incredibly hardworking, has built up credibility both internally and externally, is always humble, and has the utmost integrity. 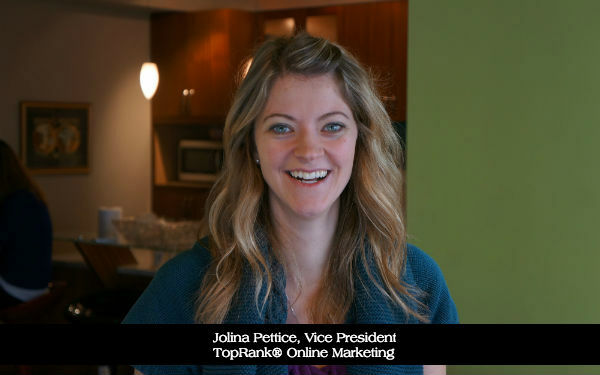 I sat down with Jolina to learn a little bit more about her journey and experiences so that she could share what TopRank Marketing has meant to her, in her own words. Please share a little bit about your journey at TopRank Marketing. First, let me start by saying that it’s been amazing. I started at TopRank Marketing as a PR Associate. PR & Journalism is what I had studied, and after tinkering around a bit, it was time to put my degree to work (thank you mom for the nudge). My first year was focused on assisting clients with their PR efforts, through content creation and pitching journalists. Thankfully, I have pretty thick skin and getting hung up on several times throughout the day didn’t get to me. This was 9+ years ago, so SEO and digital marketing in general was still relatively new to many organizations. I was really fascinated by the integration of a client’s PR efforts with a broader online mix and the results it could produce. And I mean really fascinated, like Googling all day and all night trying to figure out what was showing up for what terms, what did the sites look like that were ranking, what did they have (or not have) as compared to the clients I was working for. This was the start of my journey beyond PR and into Account management. So all was pretty good, I was learning the ropes and finding my work to be satisfying. And then out to lunch one day, Susan Misukanis (TopRank Marketing’s President and Co-founder) asked me what I wanted to do next. Continue in PR or try something new? I still remember it like it was yesterday, so new into my career and having someone genuinely interested in what I was thinking about and hoping to accomplish. So, without hesitation, I jumped in and said, “I want to be an Account Manager!”. The ability to learn more about all areas of marketing, and frankly get to be responsible for client programs, was really appealing to me. And from that day and into the next year, Susan and Lee graciously taught me everything I needed to know, and beyond that gave me the freedom to test, create, fail, and flourish. And for that, I am so very grateful. Fast forward a couple years, multiply clients a couple times over – and next thing you know we’re building out teams in areas from Account Management, to Social, to Content, and more. And here I sit, almost 10 years later, with the most talented team, clients I consider friends – and so excited to see what we accomplish next. What have you learned most from the clients you’ve worked with? The best client-agency relationship is when you are both learning from one another. And I’ve been so lucky to work with great brands and the people behind them. One of my favorite parts of being agency-side is that you catch a glimpse of so many different settings from startups to enterprises. So, I’m probably most grateful for the sheer amount of business experience you can gain by paying attention to how different businesses operate. And of course, you can’t beat it when a client teaches you what is – and is not – authentic BBQ. What’s the best piece of advice you can give managers looking to grow into a position like yours? I would say two things. The first is to keep your eye on the prize, which should be whatever ‘success’ looks like to your organization. It’s easy to get pulled in multiple directions, so you have to find a way to keep yourself and your team focused. The second would be not to try and go it alone. When you’re new to management it can seem very daunting and you will come across situations that you can’t always plan for. Find a mentor, read books, do whatever you can to be prepared for whatever may come your way. How do you believe that TopRank Marketing has proven to be “Smart, Creative and Focused on Results”? Smart: Our team was one of the first to pioneer the idea of integration between PR and marketing and working with influencers and content marketing. We’ve avoided chasing shiny objects and instead focusing on what drives value for our clients. Creative: We’ve been creative in the way that we recognize that for any given client there may be limited resources to get the job done. In these situations, the team has worked hard to create efficiencies and process that enable us to create the best possible solution for our clients. Another creative approach that we’ve taken is to create content that allows us to build an asset and break it back down to create continuity of message and lot of promotable assets for our clients. Focused on Results: We strive to recommend a marketing mix for clients that we think will drive the best results. If you can’t serve the audience you’re trying to reach and the marketing mix isn’t a fit for the culture that you’re working for, then it’s not worth the time and energy to go chase it. Staying really true to what can garner the best results for your client is the most important thing. Do you want to be a part of a team that encourages and rewards smart, creative and results focused work? View our current openings. If your business is in need of a team of marketers that will work alongside you to define and meet your business objectives, let’s have a conversation. Hey, how about that! Congrats, Jolina and nice move Lee! She’s a superstar 🙂 Hope you are well Frank.